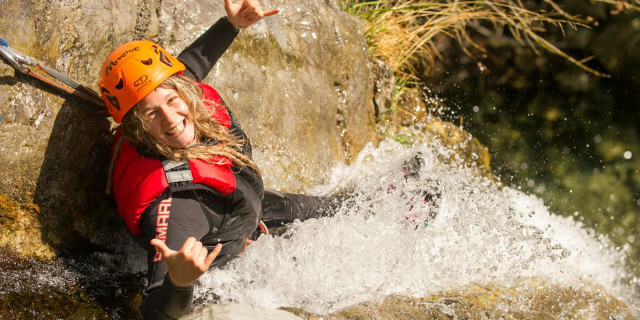 Fill your day with canyoning adventure as you navigate the complex rock world of Rio Nero. 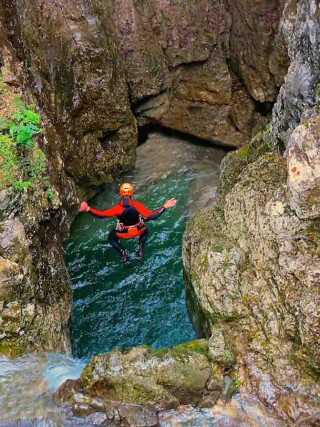 Only for those with canyoning experience. This tour is public but runs on request. Please enter your preferred date in the booking form, and you will join a group. 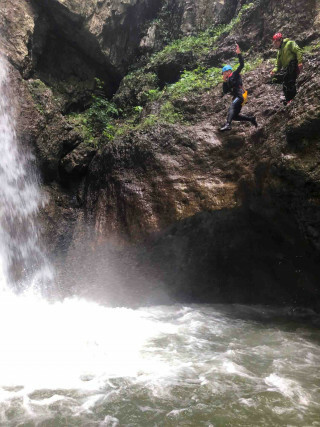 Only people with previous canyoning experience can join this tour. Minimum age is 14 years old. Each guide travels with a minimum of 4 people and a maximum of 6 people. Larger groups will be split among guides. The meeting point is in Arco, a town just north of Lake Garda, at 8:00 a.m. 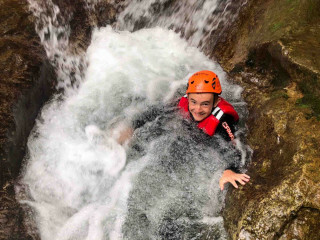 Previous canyoning experience is preferred. Be sure to wear a bathing suit, towel, water, a snack, and athletic clothes and shoes that can get wet. You can cancel up to 48 hours in advance with 100% money reimbursement. There is no reimbursement for later cancellations. If you are looking for a true canyoning experience, then the canyon Rio Nero “extended version” is exactly what you need. 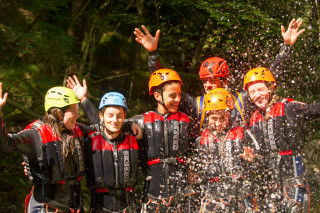 With endless gorges, slides, and abseils, this is a true challenge even for canyoning experts. The “black river” is surrounded by steep and high rock cliffs. Over the centuries the water has created a fairytale landscape. Caves, grottos and spectacular rock formations create a series of wonderful natural scenery. Join an excursion requiring endurance and an adventurous spirit. 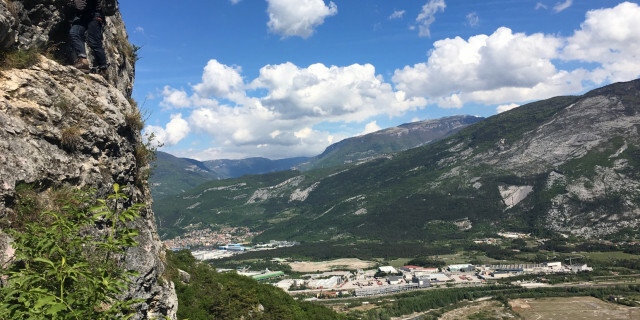 Discover the buzz over the reopening of the Via Ferrata Monte Albano and challenge yourself to a dynamic route along jagged walls and smooth slabs. Palvico is without a doubt one of the most impressive and fun canyons in Northern Italy. 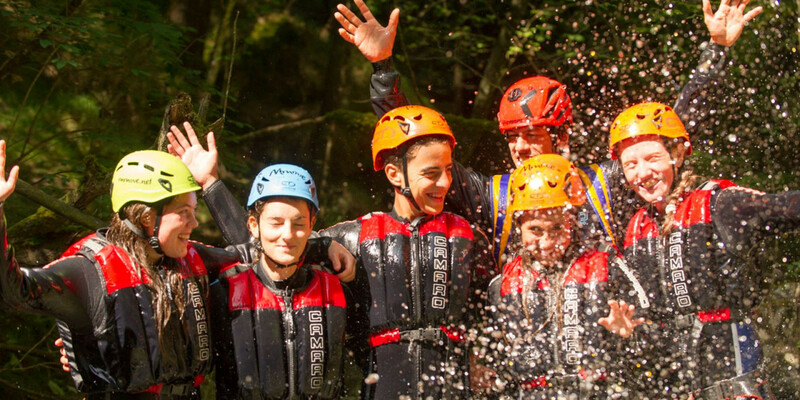 Towering waterfalls, cliff jumps, splashy slides, huge caves, magical play of light and a breathtaking 50m waterfall abseil make this canyoning excursion an experience of a lifetime. 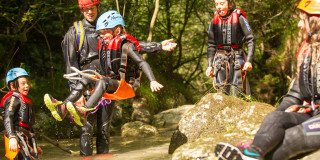 Splash your way around the streams of Lake Garda’s rock sculptures for a canyoning adventure with the whole family.